For many years the Culinary Institute of America and Johnson and Wales were where students who wanted to become top chefs went for their education. And while those two storied institutions remain among the very best in America, many culinary arts colleges and universities around the country feature first rate programs headed by world-renowned chefs. What follows are 25 of the best. Tuitions are also included; most of the schools named have one tuition for in state and out-of-state students, except where noted. The Culinary Arts Institute has a partnership with Hinds Community College that allows students earning their associate’s degree in culinary arts at Hinds to continue their bachelor’s degree studies at the Hinds campus with instruction from The W faculty. Students complete the required courses in business online with the W.
The Bachelor of Technology in Professional Studies with a concentration in Culinary Arts also allows those holding an Associate of Applied Science degree to progress toward a baccalaureate degree by accepting a predetermined amount of career and technical credit. The B.T. graduate will be able to combine the applied skill set learned in his or her career/technical program and his or her accrued real-world experience with additional skills learned at The W to develop career pathways. Keiser University Center for Culinary Arts is accredited by the American Culinary Federation. Its Associate of Science degree in Culinary Arts presents a comprehensive curriculum that includes laboratory sessions, academic preparation and hands-on experience. Students acquire professional knowledge of food, its preparation and handling and cooking from basic to advanced. The curriculum includes an externship to prepare students for entry-level positions in the foodservice industry. Restaurant kitchens are fast-paced environments, requiring efficient, practiced and accurate skills, and the hands-on approach in OCI’s two Culinary Arts programs will enable students to experience exactly what those environments are all about. The school’s food philosophy mirrors that of Portland’s – and the country’s – best restaurants. Fresh. Seasonal. Farm-to-table. Local. Organic. Quality. And students get to put it all into practice at our own open-to-the-public fine-dining restaurant before embarking on a professional externship. It’s all designed to equip students with the skills and confidence needed to immediately start pursuing their dream career. Tuition: For their various 64 hour management degrees: $28,350; for their 32 week baking and pastry diploma: $15,435; for a restaurant management diploma course of 32 weeks: $16,695. Platt College’s comprehensive culinary arts programs offer students a broad-based culinary education that includes food theory and practical instruction through hands-on experience. Major areas of study include safety and sanitation, baking and pastries, food management, and working in a hot kitchen. The instructors and program designers at the culinary schools have worked tirelessly to create culinary training courses that satisfy the needs of today’s evolving food service industry. Upon completion of the ACFEFAC-accredited programs, students may pursue culinary careers working at hotels, restaurants, resorts, catering companies and other commercial food service organizations. 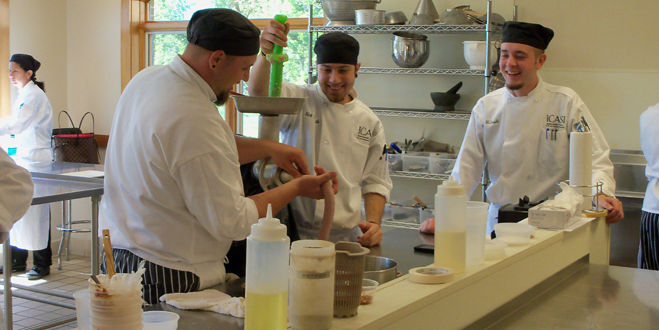 At Platt College, students can learn in a professional-style kitchen from chefs who have real industry experience. Students may also earn the chance to work in one of Platt’s three institution-owned fine dining establishments. CASI founder Loretta Paganini began her culinary career in the family pasticceria owned by her mother, a renowned chef in Bologna, Italy. Loretta later studied culinary arts in Bologna under the Simili Sisters and at the Cordon Bleu in Paris, France. In 1989 she opened The Loretta Paganini School of Cooking in Chesterland, Ohio. Certified by the International Association of Culinary Professionals, she published her first cookbook, Bologna Mia in 1999. The Loretta Paganini School of Cooking (LPSC) has brought recreational culinary education to thousands of students since its inception. Due to growing interest from LPSC students for more advanced vocational culinary training and an increase in demand for qualified candidates for the Northeast Ohio foodservice industry, Loretta Paganini founded ICASI, the International Culinary Arts and Sciences Institute. ICASI continues the LPSC tradition of excellence. ICASI is registered with the State of Ohio Board of Career Colleges and School. At Culinard, the faculty is committed to offering students the opportunity to earn a superior, intensive education in the culinary arts. Top chefs share knowledge, skill, and their passion in an effort to help each student realize his or her dream of a culinary career. Fine cuisine is more than merely good food. It is an art. Preparation and presentation demands knowledge, skill, and above all, a passion to create. And with the new 36-week culinary immersion program, students can learn the skills that enable them to pursue a career in the culinary arts…and the chance to turn their passion into a career…much more quickly and easily. Few culinary institutions possess the reputation and history of Le Cordon Bleu. This internationally known culinary arts school is synonymous with expertise, innovation, tradition, and refinement – qualities that are meticulously nurtured by Le Cordon Bleu. The name “Cordon Bleu” [meaning Blue Ribbon] is rich with history and heritage. It has been synonymous with excellence since 1578, when King Henry III created the “L’Ordre des Chevaliers du Saint Esprit” [The Order of the Holy Spirit]. It was the most exclusive order in France until 1789. Because the members, royalty included, were awarded with the Cross of the Holy Spirit, which hung from a blue ribbon, they were called “Cordon Bleus”. The sumptuous banquets which accompanied their award ceremonies became legendary. Today, there are 30 Le Cordon Bleu schools worldwide, spanning 5 continents, including 16 campuses throughout the United States, each with students and alumni from culturally diverse backgrounds. Le Cordon Bleu in North America ushers in a new educational era in culinary arts, pâtisserie and baking, and hospitality & restaurant management that combines classical European techniques with contemporary American technology and training. As a result, students are afforded opportunities to acquire the knowledge and skills necessary in the culinary, pastry and baking, and hospitality world. LCI’s goal is to provide high quality training and a conceptual understanding of Professional Cooking and Culinary Arts or Hospitality and Culinary Management; to prepare students for entry into mid to upper-mid level positions in the food service industry; and to equip students with the skills necessary for advancement and new enterprise during a culinary arts or management career, including business communications skills and the essentials of food service business management skills. How long will it take to get my Associate Degree? : The Louisiana Culinary Institute’s Programs are based on a Clock Hour / Semester Credit Hour System. Semester Credit Hours are granted upon successful completion of each course. Clock Hour / Semester Credit Hour conversions are listed in the Louisiana Culinary Institute Program Outline. LCI’s Associate in Occupational Studies in Culinary Arts Degree Program is 1335 Clock Hours / 67 Semester Credit Hours in length and takes 4 Semesters or 64 weeks or 16 months including holidays and semester breaks to complete in normal time. The Institute of Culinary Arts at RMU provides a creative environment that simulates the culinary world. At RMU you will work in industry-equipped kitchens, using fine ingredients and commercial-grade tools. You will work alongside professional chef instructors who share their real-world experience and encourage you to develop your own creativity. These masters of the craft teach classic foundational techniques and innovations essential to any style of cuisine. Through a methodology of demonstration followed by hands-on application, you can develop new skills and the confidence to continue your journey to a world of culinary possibilities. As a hospitality, resort, and culinary management student at Paul Smith’s, you’ll be part of an academic tradition that’s respected nationwide. Graduates are sought by prestigious properties across the country because of the education and training they get in this school’s top-notch programs. Paul Smith’s has a long tradition of being “about the experience.” Their practice of integrating academics and experiential learning is brought to life within all of our programs in hospitality, resort and culinary arts management through a series of hands-on learning experiences, which are an integral part of most course work. Our integrated learning experience is delivered on the Paul Smith’s campus in facilities that include six commercial-quality food laboratories and a baking laboratory equipped with commercial baking equipment. These hands-on learning experiences are further reinforced in a semester-long series of hotel, culinary and food service work experiences. Students develop and practice skills under the direction of faculty while working off-campus with industry professionals at a variety of hospitality and food service businesses. For years, culinary and pastry professionals have been graduating from this schoos, and many have gone on to achieve personal satisfaction and professional acclaim in establishments and institutions around the country. Most chose Auguste Escoffier School of Culinary Arts over bigger, less personal schools because they offer, among other things, small class sizes. This school also has a 3 1/2 star restaurant, Winston’s, that is run by culinary students, a catering facility that serves the community, and a retail bakery. Sullivan University’s National Center for Hospitality Studies is preparing students for careers in the hospitality field by offering five Associate of Science (A.S.) Degree Majors. Students can earn an Associate of Science Degree in Culinary Arts; Baking and Pastry Arts; Professional Catering; Hotel and Restaurant Management; and Travel and Tourism. The University also offers Diplomas in Professional Cooking and Professional Baking. Rated by Emeril Lagasse as one of the best culinary schools in America. The Culinary Arts and the Baking and Pastry Arts programs at Sullivan University’s National Center for Hospitality Studies are accredited by the American Culinary Federation’s Accrediting Commission. For more information about graduation rates, the median debt of students who completed Sullivan’s programs, and other improtant information, visit here. Taught entirely by experienced, working chefs and experts in the food industry, Boston University’s full-time culinary arts program is the only one of its kind in the country. Cofounded by Julia Child and Jacques Pépin in 1989, this intensive, semester-long program exposes students to classic French techniques and international cuisines. Merging the best aspects of traditional culinary arts study with hands-on instruction in BU’s state-of-the-art laboratory kitchen, the program provides insight into the food industry and prepares students for a wide variety of jobs. Alain and his wife Marie own the Culinary Institute LeNotre. Alain is a certified pastry chef, candy maker and ice cream maker; he was also trained as a cook at the Grand Véfour, a famous 3-Star Michelin Restaurant in Paris. He has over 40 years of experience. Alain earned an executive MBA from the University of Paris I. Alain comes from a famous Parisian family. 30 years ago he created the chef school Ecole Lenotre in Paris, France, one of the world’s best retraining schools, where he taught for a number of years. He developed the international LeNotre pastry shop franchise and technical assistance departments, expanding the LeNotre chains in Japan, Germany and Brazil while also helping his parents’ business become the number one caterer in France. After receiving a request for a franchise in Texas, Alain and Marie were invited to visit Houston, Texas in 1981. Ultimately they started their own business there, first with a retail and wholesale bakery. In 1998, they opened an international cooking and baking school for career seekers, career changers, food enthusiasts and also for continuing education. As their fame was spreading they have been asked to franchise their “Know How” in the Middle East. There are now 10 “Alain LeNotre” restaurants and bakeries in Cairo, Egypt. Alain LeNôtre motto is: “Tradition, quality & respect”. He chose the word tradition because he is the 3rd generation of chefs in the LeNotre family. Experience and modern 73,000 square foot facilities come together at Texas Culinary Academy, which has been successfully training students in the culinary arts for over fifteen years. A brand new facility recently opened at the school and includes laboratory, kitchens, classrooms, a restaurant, and retail store as well as a dramatic demonstration area that was modeled after Le Cordon Bleu in London and Paris. The school is located in Austin Texas which offers a thriving art, music, and restaurant scene and was recently ranked the second best place to live in the country by both Money* magazine and Men’s Journal**. Students in their Culinary Arts and Pâtisserie & Baking programs can learn everything from basic cooking and pastry skills to purchasing and cost control—along with essential business know-how required for success in this competitive field. Financial Aid is available at Texas Culinary Academy. This is the only Cordon Bleu affiliated cooking school in Texas. The Institute of Culinary Education (ICE) is New York City’s largest and most active center for culinary education. 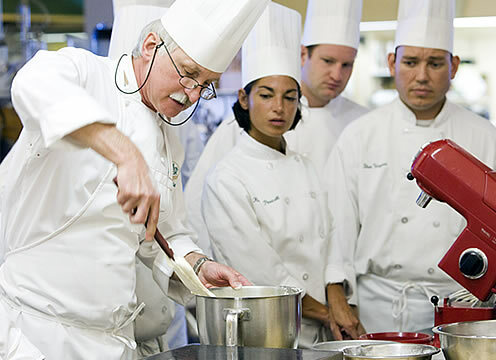 Founded in 1975 by Peter Kump, the school offers highly regarded eight to 13-month career training programs in Culinary Arts, Pastry & Baking, Culinary Management, and Hospitality Management. With an in-depth global curriculum, dedicated chef-instructors, a strong record i n job placements, and a clear entrepreneurial focus, ICE is widely recognized by top industry organizations as a premier pathway to begin or continue a culinary career. ICE also runs the largest program of hands-on recreational cooking and baking classes and wine education in the country, in addition to hosting hundreds of corporate and private cooking events a year. ICE was a finalist and winner of the International Association of Culinary Professionals’ 2002, 2003, 2006, and 2008 Awards of Excellence for Culinary Schools. ICE students and alumni regularly are nominated for or win top industry awards, such as James Beard awards, Food & Wine’s Best New Chefs in America, and Dessert Professionals’ Top Ten Pastry Chefs. Location: Providence, R.I., Miami, Fla., Denver, Col., Charlotte, N.C.
At Johnson & Wales University, you won’t only learn to be a great chef. You’ll also learn to change the way the world eats. The JWU College of Culinary Arts is globally-recognized because it’s at the leading edge of 21st-century culinary education. The school’s range of standard, accelerated and weekend associate and bachelor’s degree programs are as varied as your career interests. Whether you choose culinary arts, nutrition or baking & pastry arts, all the programs combine the craft and art of cooking with science and nutrition, management skills, global citizenship and a variety of work experience opportunities that will set you apart from the competition. And, when you graduate, you’ll be positioned to pursue the growing range of food service careers locally or around the world. There are no demo kitchens here. You’ll learn by doing, mastering the craft of culinary arts in top-notch labs, under the guidance of expert chef-instructors in classes with an 18:1 student/teacher ratio. You’ll also benefit from an integrated arts and sciences curriculum to provide you with the analytical, critical thinking, and communications skills necessary for long-term career advancement. Founded as The French Culinary Institute, the International Culinary Center (ICC) is an award-winning school for fast-track culinary education, with 15,000+ alumni including such talents as Bobby Flay, David Chang, Dan Barber and Christina Tosi. This year, ICC graduates scored 15 nominations for James Beard Awards, the Oscars of the food world. Whether the focus is Culinary, Pastry, Cake Design, Bread, Wine Studies or Entrepreneurship, an ICC graduate leaves with the credentials, confidence and global connections for a rising career. Total Immersion, hands-on curriculum transforms students from novice to professional skill levels in months, supplemented by unlimited culinary business classes and personal career services long after students graduate. Deans include legendary chefs Jacques Pépin, Jacques Torres and José Andrés. A low student-to-teacher ratio assures the attention needed to flourish. Study at a place named “Best Vocational Cooking School of the Year” by the International Association of Culinary Professionals, and awarded the highest honor, School of Excellence, by the accrediting commission. Those seeking a college degree can transfer credits from ICC courses toward an associate’s or bachelor’s degree at The New School, a highly regarded NYC university. The finest culinary arts school in the heart of New England. For more than 27 years, New England Culinary Institute has enjoyed a niche all its own – small classes, personal attention and celebrated restaurants. Graduates of New England Culinary Institute are sought after the world over for their level of skill, passion, and preparation. New England Culinary Institute has two campuses, one in Vermont’s state capital of Montpelier and the other in scenic Essex, Vermont. Students have the opportunity to receive hands-on training in the free standing restaurant, retail and non-commercial operations of our Montpelier campus as well as the experience of a Four Diamond culinary resort and inn on our Essex campus. Widely recognized as the most prestigious culinary school in America, and among the best in the world. Not only that, but it’s set against the Hudson River at a beautiful location. 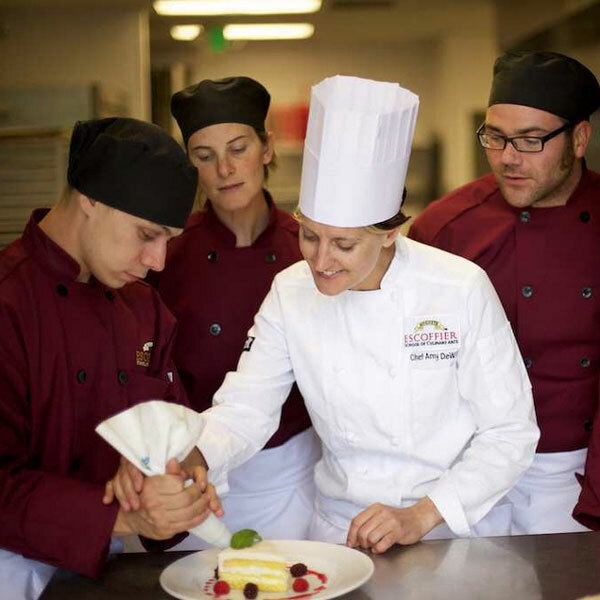 A CIA credential is highly sought-after by foodservice and hospitality employers, and the college’s 48,000-strong network of alumni—many of whom are industry leaders and innovators—is a testament to that.